Some exciting changes have been taking place here at SMI. For those of you who have recently been into our facility, we know that it has been a bit noisy, cluttered and dusty, and we thank you for your patience. The good news is that we are now done! The carpet is down, the walls are painted and the new furniture is in place. So come and see our bright, fresh new look. We hope you like it! In our attempt to provide the best service possible, we encourage clients to offer constructive feedback on anything that can help make SMI a better facility. You can always contact Mark Fadil directly either through e-mail at Mark@smiweb.org or by calling at 650-823-1091. Now you can also send an anonymous text to 650-276-5392 through a program called “Talk to the Manager”. This will go directly to Mark, but the sender will remain completely anonymous. Either way, feel free to contact us with any questions, concerns or feedback you may have. Intuitively we all know that sleep is good for us. We feel better when we have had a good night’s sleep and grumpier, less patient, not as focused and don’t have as much energy when we are short on sleep. But, we don’t have a good understanding of what sleep does, why we need it and how much is ideal. Recent research has started to open the doors on this enigmatic yet essential aspect of everyday life. A study published in Science has discovered that sleep actually helps clean the brain. (1) More specifically, waste products that gum up the spaces between neurons in the brain, including the beta-amyloid plaques that contribute to Dementia and Alzheimer’s disease are pushed out of the brain. During sleep, the volume of space between neurons increases by over 60%, inducing convective flow (suction) of cerebrospinal fluid like a pump, pushing the fluid and waste out. Make sleep a primary wellness goal, even if it means taking time out of your busy schedule to relax before trying to get to sleep. We still do not know the ideal number of hours to sleep each night. Recent research has found that this may vary from person to person based on genetic factors. (3) Until we develop a more thorough understanding, the best gage for how much sleep you need can be based on how you feel. Do you wake up feeling tired or like you need more sleep? Do you nod off during the day? Do you feel tired, groggy or irritable during the day? If so, you should probably be getting more sleep. Research will hopefully begin to shed more light on an ideal amount of sleep, but in the meantime you can base it on how you feel. That sleep is required for the brain as well as for the rest of the body is self-evident by its ubiquity in nature, but the discovery of another physical reason so important as this provides direct motivation to take sleep as seriously as all other aspects of wellness, if not more so. (1.) Xie et al., “Sleep Drives Metabolite Clearance from the Adult Brain” in Science 342 2013 373. (2.) Iliff et al., “CEREBROSPINAL FLUID CIRCULATION”: A Paravascular Pathway Facilitates CSF Flow Through the Brain Parenchyma and the Clearance of Interstitial Solutes, Including Amyloid β” in Sci Transl Med 15 August 2012. Normal healthy arteries are capable of dilating to increase blood flow or contracting to decrease blood flow. As we age, arteries tend to become stiffer and more rigid. Increased arterial stiffness is associated with an increased risk of cardiovascular events such as heart attack and stroke. Utilizing ways to slow or reverse arterial stiffness should therefore have a positive impact on overall health. Previous studies have found that aerobic exercise has a significant positive impact on arterial stiffness. (2) In a more recent study published by the Journal of Strength and Conditioning Research, researchers investigated the effects of foam rolling on arterial stiffness and vascular endothelial function. The participants of this study included ten healthy individuals who had not exercised for at least one year. Participants were randomly assigned to a control or self-massage group. The self-massage group performed foam rolling on the muscles of the lower extremities and back. Each area was massaged back and forth for 20 repetitions as the user controlled how much pressure to apply. The individuals in the control group simply rested on their backs. Arterial stiffness, blood pressure, heart rate, and plasma nitric oxide (NO) concentration were measured before and 30 minutes after foam rolling. Arterial stiffness significantly decreased and NO levels significantly increased in the foam roll group. There was no change in the control group. Nitric oxide controls blood flow by acting as a vasodilator or blood vessel relaxant. So as NO levels increase, arterial stiffness decreases. The study only looked at the immediate short term effects of foam rolling on arterial stiffness. It would be great to see if there is a long term impact with consistent foam rolling as well. If you have any questions or concerns, please don’t hesitate to contact us at 650-322-2809. (1.) Okamoto T., Masuhara M., Ikuta K. (2013). “Acute effects of self-myofascial release using a foam roller on arterial function.” Journal of Strength and Conditioning Research. 28:1:69-73. (2.) Ashor, Ammar W. et al. “Effects of Exercise Modalities on Arterial Stiffness and Wave Reflection: A Systematic Review and Meta-Analysis of Randomized Controlled Trials.” Ed. Yan Li. PLoS ONE 9.10 (2014): e110034. PMC. Web. 12 Mar. 2015. 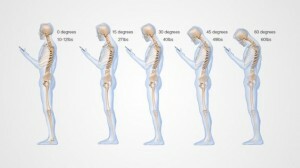 Smart phones have become a real pain in the neck… kind of. Technology is constantly evolving at a faster and faster rate. Living in Silicon Valley, many of us are the first adopters of the latest and greatest technological advancements. These advancements are designed to make life easier but can often times have unintended negative consequences as well. One of the more recent advancements that seems to have created an uptick in pain and dysfunction over the last few years is the smart phone. Shortly after Dr. Hansraj released the findings of his model, all the major news outlets seemed to carry a story about “text-neck” and the risk of permanent neck damage from using a smart phone. A very small minority has questioned Dr. Hansraj’s conclusions claiming that the body is adaptable and that posture does not correlate with pain. (link) But adaptability does not necessarily result in improved function. Our discs adopt by bulging and herniating. Is that good? Probably not. The bottom line is that our bodies can handle the stress from looking down at a smart phone just fine for short periods of time, but prolonged use in a stationary head forward and down position can begin to cause pain and dysfunction. In addition to smart phone use, we also see the same type of pain and dysfunction associated with prolonged stationary laptop use, cycling and looking through a microscope. The bottom line is that our bodies are made to move. Sitting, standing or lying in one position for an extended period of time will eventually start to cause pain and dysfunction. Smart phones are just one more thing in our modern world that keeps us in a fixed position. So be cognizant of your body, the positions you are in and the amount of time you are spending in those positions. It is unrealistic to think that people are simply going to stop using a smart phone. So here are some simple guidelines to follow when using a smartphone. (1.) Never have your head tilted down to look at your phone for more than 5 minutes at a time. (2.) When you take a break from tilting your head down, look up at the ceiling and then from side to side. (3.) Make sure to stretch your neck periodically when using your smart phone for extended periods of time. Putting the Band back together…the IT Band that is! Massage and Low Back Pain: There’s the rub! Kinesio Tape: Will it stick? Acupuncture — Dry Needling, What is it? Nutrition — Just One Thing!